Our portable devices need more storage, so we collect a growing variety of memory cards -- SD and MMC, and reduced to mini and micro. And these removable cards provide another option for copying files between devices and a PC -- after all not all devices have USB interfaces (like some mobile phones), or they require an extra and sometimes non-standard cable that is not always at hand. The answer, then, especially for travel, is small USB card readers about the same size as USB thumb drives. Slide in the card, plug in to a PC's USB port, and access the memory card like a removable disk drive. Kingston has recently added several such portable card readers, with different numbers of slots to support various memory card formats. And there's also a USB drive with built-in memory, plus a slot to read additional cards. The Kingston USB microSD Reader is a tiny device -- Pull out the USB connector, insert the microSD card, and reassemble. It's available bundled with a 1 GB microSD card $25 (black), and 2 GB $41 (red). 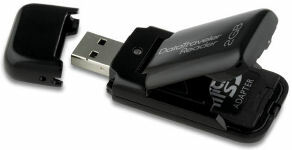 The Kingston DataTraveler Reader is a 1 or 2 GB USB Flash drive with a card reader slot. It reads SD, SDHC, MMC, and MMCplus cards, plus (with a separate adaptor, not included) miniSD, microSD, RS-MMC, MMCmobile, and MMCmicro. It's available bundled with a 1 GB SD card for $24, 2 GB for $54 (list), with 4GB coming soon. The Kingston MobileLite 9-in-1 Reader opens on both sides with three card slots. Side A reads SD, SDHC, MMC, MMCplus, RS-MMC, and MMCmobile. Side B has a slot for miniSD, and a second slot for microSD and MMCmicro (the reader appears in Windows as three drive letters). The reader is $11, or is available bundled with a 1 GB SD card for $29, 2 GB SD soon, or 1 GB microSD for $29. See more in the Portable Storage Gallery, under USB Memory Card Readers. Kingston continues to release USB flash drives with interesting designs, and now with up through 8 GB of storage. 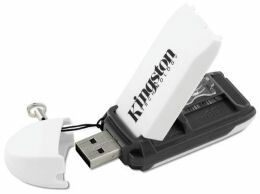 The Kingston DataTraveler 100 USB Flash Drive has a simple capless design with single-handed "thumb-action" slide. 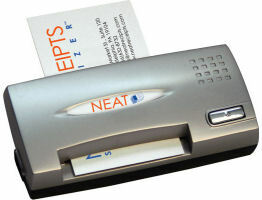 The retractable USB connector is housed safely inside the casing. It's available with 1 GB for $19, 2 GB for $32, 4 GB for $59, and 8 GB for $116 (MSRP). The Kingston DataTraveller II Plus - Mingo Edition includes Migo synchronization software to bring your Windows deskstop to multiple PCs in different locations, and still leave no trace of personal data behind. It brings along your own desktop's files, folders and icons, Outlook email contents, Internet Explorer settings, favorites, cookies and history. And it automatically synchronizes your data when you return to your PC. It's available with 1 GB for $20, 2 GB for $40, 4 GB for $75, and 8 GB for $154 (MSRP). Kingston just announced a new USB / microSD Mobility Kit, that combines its Kingston USB microSD Reader with a 1 or 2 GB microSD card, plus two adaptors, for both a miniSD and full-size SD card. It's everything you need to add storage to devices like cell phones which use the tiny microSD, and then read the memory on any larger miniSD / SD slot. The reader is amazing -- it's basically just an extra-long USB connector, with the USB interface at one end and a slot for a microSD card at the other (the microSD card actually is so small that fits loosely in a USB connector). Then pull the handy keyloop to slide the USB connector into the protective cover to shield the card. The Mobility Kit is available bundled with a 1 GB microSD card for $27 (black), and 2 GB (red) -- soon. It's the best of both worlds for mobile music fans -- A multi-use stereo headset to listen to your music, that also has an integrated microphone for hands-free mobile phone use. These take advantage of two upgraded Bluetooth specs: A2DP (Advanced Audio Distribution Profile) for stereo music (not just mono voice for mobile phones), and AVRCP (Audio Video Remote Control Profile) for remote control of the playback device. These Sony Stereo Bluetooth Headsets have controls to adjust the volume, answer calls, play and stop music, and even forward and rewind. And they can simultaneously connect to two devices: a portable media player for playing music, and then switch over to a mobile phone for receiving and making calls. They use Li-ion batteries that charge in 3 hours, to provide 11 hours of talk and music playback time, and 100 hours of standby time. The Sony Stereo Bluetooth Headset DR-BT30Q is a minimalist design -- It has earpieces that clip on behind the ear, connected with a 20" retractable zip cord. It weighs about 2.1 oz., for $129. The Sony Stereo Bluetooth Headset DR-BT21G is a snazzy "street style" headset worn behind the head that hooks over the ears. It weighs about 2.3 oz., for $129. It folds up for storage. 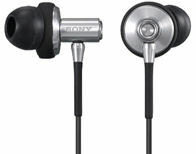 If you're looking high-end wired earphones, check out the Sony Stereo Earphones MDR-EX90LP with a metal housing. It includes 3 sizes of earbuds and a leather carrying case, for $100. Continuing with Sony audio accessories ... Portable music players are great for personal use, wired to a headset or wireless to a Bluetooth headphone. But sometimes you want to share the music, or just listen without having to wear earphones. Sony offers two interesting options: a pocket-size portable speaker that doesn't even need batteries, and a lap-sized Bluetooth speaker that can play wirelessly. The Sony Travel Speakers - SRS-TP1 are passive travel speakers. Just attach to your music player and they just work -- no batteries or AC adaptor is required. They're not terribly loud, but work great in a relatively quiet room. These pocket-size speakers even store flat; the protective speaker lid folds under as a speaker stand. They connect to players with a 12" straight stereo mini plug, weigh 7 oz., and are available in white or black for $24.99. 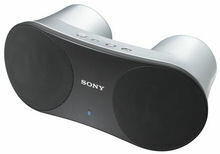 The Sony Bluetooth Speakers - SRS-BTM30 has a stereo minijack input for direct connection to audio players, plus support Bluetooth A2DP for stereo audio. These 3W stereo speakers sound great playing wired to a tiny MP3 player, and wirelessly from a mobile phone (your experience will of course depend on the quality of the original material). These lap-size speakers have a volume control, and are powered with AC adaptor or 3 AA batteries They're around 11 x 4 1/2 x 5 1/5 inches, weigh 1 lb. 10 oz., and are available for $149.99. Many portable media players, cell phones, and other devices like phone headsets use USB connections to synchronize with computers, and to recharge over the same cable. But sometimes you don't have a computer handy to recharge your device, or you need to recharge multiple devices at the same time -- which is why stand-alone USB-based power adapters can be so useful. Here's the idea -- A wall power adapter with a standard USB interface, so you can plug in your devices just like you do with a computer, using the same cables that came with your devices. Then add additional cables and adapter tips to charge other devices. There's no product-specific custom connectors or adapters -- just standard USB connectors. The Belkin Dual USB Power Adapter is a handy package for charging iPods and other devices that use the mini-USB interface. The power adapter has two USB connectors, and folding prongs. The product includes two 6 foot cords. Use the USB-to-dock connector cable for iPods, including video, nano, and minis. Use the USB-to-mini-USB cable to charge many popular cell phones and other mini-USB charging devices. It's available for $29.99. MDI SynCharger has expanded on this idea with a broad line of USB-based power adapters, charger cables, and mTips adapters for iPods and media players, mobile phones and smart phones, portable game players, mobile headsets, and other devices ($6.95). MDI has new adapters for Nintendo Game Boy, Samsung smartphones, HP PDAs, as well as more USB Micro mTips for cellphones, headsets and other devices. You also can use the 6V and 9V Boosters to step up from 5V USB. There's a new slim Dual USB Wall Adapter ($14.95), which you can use with the kwikSynCh Dual Charger cable (pictured above, $14.95) to charge four devices at a time. So you can charge multiple devices from your computer, or from wall power, or with a car adapter. Apple has released Apple iLife '08, with major new version of iPhoto and a "completely reinvented" iMovie. The complete suite includes iPhoto, iMovie, GarageBand, iWeb, iDVD, and the new .Mac Web Gallery. It's included with all new Macs, or available for $79, or as a Family Pack (5 computers) for $99. iMovie '08 introduces an iPhoto-like video library to display and organize all your clips, stored on internal or external drives. Like the new iPhoto, iMovie automatically groups video by Events, based on the day shot. And you can preview clips “skiming” the mouse as with a dynamic filmstrip. Import video from latest AVCHD, HDV and DV camcorders, digital cameras, SD and HD, from tape-based and tapeless camcorders (including Flash-memory, hard disk drives, and DVD cams). Export movies on iPod, iPhone or Apple TV, and share on YouTube. iDVD '08 features better performance and additional customization. 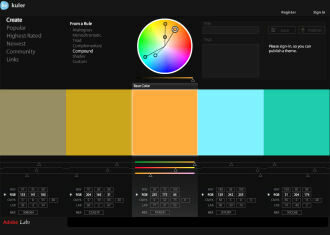 iDVD add 10 new Apple-designed themes with animated menus, 16:9 and 4:3, plus advanced menu customization, with a new button library, drop zone editor, and dynamic alignment guides. Combine video and photos in slideshows and use higher-quality photos. 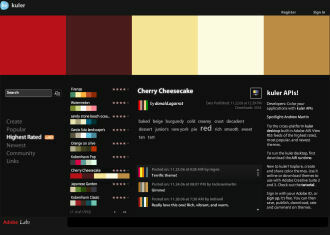 Better performance offers faster switching between themes and menus. Pro-quality encoding offers higher quality with more movies and slideshows on a single DVD. iLife requires a Mac computer with an Intel, PowerPC G5, or PowerPC G4 processor. iMovie requires an Intel processor, Power Mac G5 (dual 2GHz or faster), or iMac G5 (1.9GHz or faster. iDVD requires a 733MHz or faster processor. Does your cell phone or PDA run low on power after a busy weekend away? Need a quick boost of power on the go? Even if you're carrying a power adapter, you can't always to stop by an outlet to charge up, or rely on claiming a scarce outlet at the airport. What you need is a battery-powered charger, with an adapter for your specific phone or PDA. The Energizer Energi To Go Instant Cell Phone Charger comes in different packages with adapters for various combinations of phones (e.g., Nokia and Palm Treo, or LG and mini USB). The case is very light plastic. And since it uses two batteries it's rated to provide up to 9 hours on GSM phones and up to 3 hours on CDMA phones. 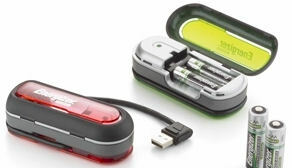 The product includes two Lithium AA batteries, and is priced at around $19.99. Energizer has introduced some interesting new approaches for battery chargers. The Energizer DUO USB Charger is powered through its attached USB cable, or with the included USB wall charger. It's a bit large for travel use, and the prongs on the wall adapter do not retract. But it's a convenient option for easily charging from a spare USB port. There's even software you can download to monitor the charging process. The top folds opens to charge two AA or AAA NiMH batteries, and the cord tucks in wrapped around the base. It charges AAA batteries in 2+ hours, 3.5+ for AA. It's available in three colors, for $13.99 (including AAA 900 mAh NiMH batteries). The Energizer Dock & Go Charger has a base charger unit with two pods that hold up to four batteries each. Each pod holds 4 AA or AAA rechargeable NiMH batteries, with indicator lights for charging, in queue, and ready to go. It charges one pod (up to 4 NiMH AA or AAA batteries) in under 3 hours, or both pods (8 AA or AAA) in under 6 hours. The Energizer Dock & Go is $33.99 (including 4 AA 2500 mAh NIMH batteries). As USB thumb drives grow in capacity -- to 4 GB under $100 and 8 GB under $200 even for higher-end drives -- they become more valuable as they hold more of our digital stuff. And yet we also want style and performance and convenience, and rugged designs to keep up with our active lives. It's also time to get rid of the protective little end cap which always wants to hide, and move to designs with a retractable USB connector. Of course, these drives need to be a bit larger to enclose the connector, and simply to add some protective bulk so they don't disappear with the cap. The SanDisk Cruzer Contour has a unique sliding design to protect the retractable USB connector. The Cruzer Contour is rugged and fast and high capacity (up to 8 GB), but the design is really striking. It has a glossy black body that slides within a silver metallic outer frame. Slide the body back and then then forward to extend the USB connector from the end of the body, and then slide it forward and then back to retract the connector into body. There's even a tiny flap that flips over the end of the connector to cover it completely. The drive also provides performance, writing at 18 MB/sec, and the reading at 25 MB/sec. It also supports ReadyBoost for Microsoft Windows Vista. The drive includes Windows-only U3 software for taking your desktop on the road by running applications directly from drive, plus password protection with AES hardware encryption. These include Skype, SanDisk CruzerSync to synchronize files, Protecteer SignupShield Passwords, plus Big Fish Games - Sudoku and Mahjong Towers Eternity. It's priced at $99.99 for 4 GB, and $189.99 for 8 GB. Another example is the newly updated Memorex M-Flyer Pilot with higher capacity, a "splash" of color, and a spring-loaded, retractable USB connector. The M-Flyer Pilot's USB connector slides within the outer shell. Push the end to extend the USB connector out the other side, and then press the button to have the connector spring back into its retracted position. The drive includes Windows-only Mingo security software for password protection and encryption, and is Enhanced for ReadyBoost for Windows Vista. It's priced at $49.99 for 2 GB (silver and blue), and $79.99 for 4 GB (silver and red). Speed and beauty, power and performance, form and function ... are we talking about a classic car, cutting-edge motorcycle, or a USB thumb drive? The new SanDisk Extreme Ducati Edition USB Flash Drive takes design and performance to a new level for USB drives, inspired by the famed Ducati motorcycle brand. The SanDisk Ducati Edition Drive has the same glossy red chassis and black trim as the Ducati team motorcycles, complete with the Ducati Corse racing logo on the top of the drive. It even has a red "tail light" that illuminates when the drive is connected to a USB port. The design feels rugged -- the USB connector retracts within the red and black case, and slides out and extends for use. It has fast read and write speed at 20 MB/sec. The product includes SanDisk RescuePRO Deluxe software for recovering accidentally deleted data. It's available with 4 GB for $124.99. These days there's no excuse for not taking your data with you -- after all, USB thumb drives offer up to 8 GB for under $200. But the same price range also can buy you 250 GB of hard disk storage, in an amazingly light and even pocket-size package. Even better, you don't need to carry an additional power adapter -- these portable hard drives can be powered from the USB cable, just like a USB thumb drive. 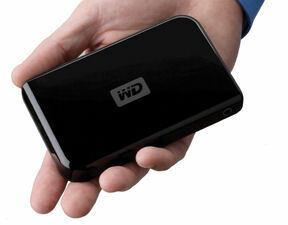 The WD Passport drive is sleek and thin, with a clean piano-black finish. It measures 5.11 x 3.14 x 0.59 inches and weighs only 0.23 pounds. It's available from 60 GB for $79, 80 GB for $99, 120 GB for $119,160 GB for $149, to 250 GB for $199. The drive is USB powered, with no external power adapter. An optional splitter cable is available for the few computers that limit bus power (to pull power from two USB ports). There's a single blue light on the side that shines to indicate a good connection, or otherwise blinks if the connection is weak (e.g., you're using a substandard cable or an unpowered USB hub). The disk includes WD Sync file synchronization and software, offers 128-bit encryption, plus Google Desktop, Picasa, and Toolbar software. 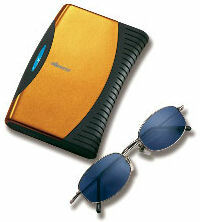 The new Memorex Ultra TravelDrive is a little bigger and thicker, designed to fit the palm of your hand. The Ultra TravelDrive includes two interchangeable color faceplates, and has rubberized anti-slip surfaces. It measures approximately 5 1/4 x 3 1/2 x 3/4 inches, and weighs 0.4 lbs. It's available from 80 GB for $99, 120 GB for $119, and 160 GB for $149. The drive is USB powered, but in my testing of a pre-production unit it needed to use the included second USB cable to provide additional power for reliable use. A speed indicator light signals a USB 1.1 or 2.0 connection. It includes back-up and synchronization software, and has a Quick Backup button to launch the backup application. Entries posted to Manifest Tech Blog in August 2007, listed from oldest to newest.